I have to admit, I’ve been feeling stressed the past few months. The late spring and sudden summer, with yard and garden chores backed up, the long list of home projects never getting shorter despite the number tackled, and taking on a few new writing gigs have compounded to set me on edge. I want to simplify my life, not complicate it. Long before bucket lists became the buzz, I had a retirement list. A mental bullet list of things I was going to do when I had more leisure time and while I was still able. Yeah, right, like that last one is ever going to happen. And now I can add organizing all the images on my computer into file folders that make some kind of sense. The bump in this stretch of my mid-life path is that my husband is retired; I am not. I have a tendency to follow detours into his realm. I find myself remembering that working from home does not mean I am not working. I still have client projects, I still have deadlines, I still have to work – even if it is part-time and even if it is on my schedule. I could quit it all. I could be just as retired as he is (even if my official retirement age is more than a decade away). In all truth, I have made a (halfhearted) attempt at retirement. But there is always some project that is too tempting, some client whose enthusiasm is contagious and the next thing I know I’m spinning back into the work vortex. Jump starting a few of my retirement list dreams has only added to my conundrum of too much to do with too little time to do it. When I’m stretching myself thinner than a diet wafer cookie, I turn into that woman with one nerve left and everybody is getting on it. That’s when I know I need to step away from the computer, step away from the house and step away from the retired husband. Today I closed my eyes to all that needed to be done, and opened them to what wanted to be done. 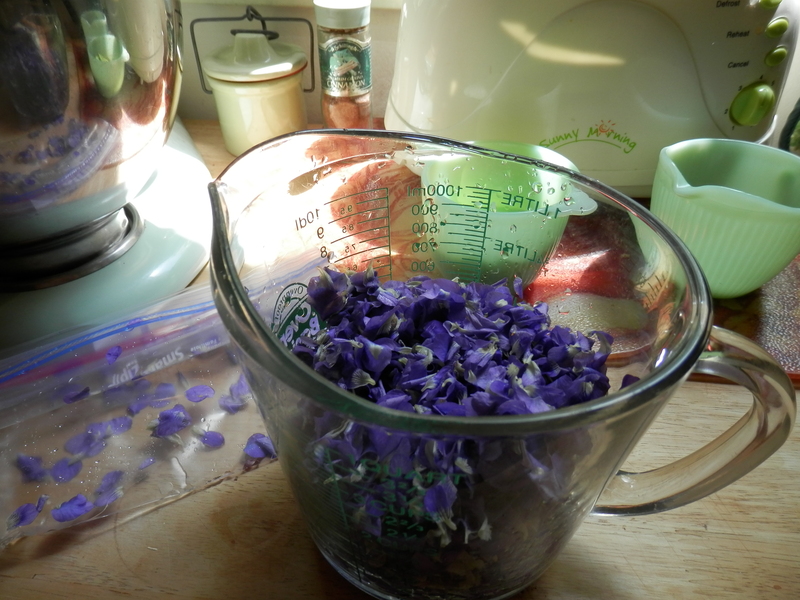 I spent over an hour picking violets instead of pulling weeds from the garden. I spent nearly as much time plucking the petals from the stems, rather than picking last fall’s dry leaves from my flower beds, even though perennials are struggling to push through. Instead of scrubbing the kitchen floor, I stirred up a sticky mess and dirtied a sink full of dishes. 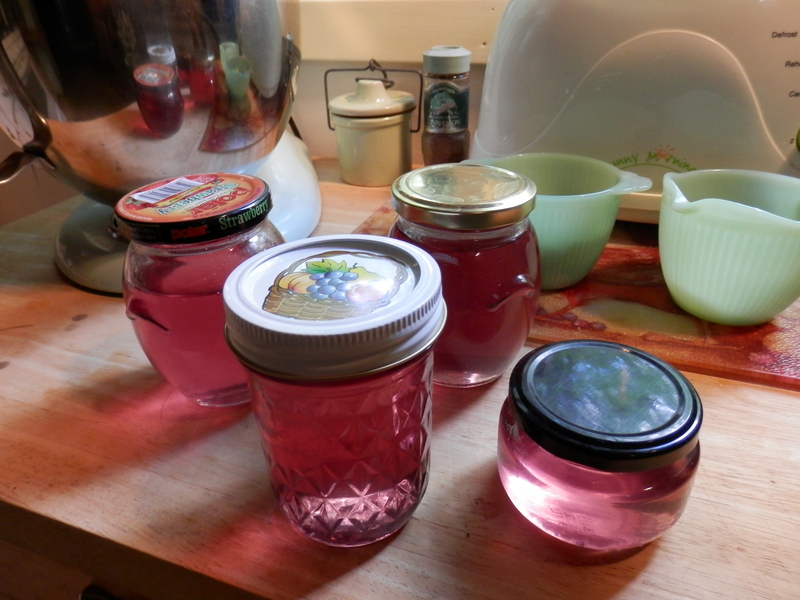 Instead of putting the laundry away, I put up four jars of the loveliest jelly I have ever seen – though the delicate pink of rose petal jelly is a worthy rival. It took me the better part of the day to make just a few small jars of this ambrosia. It was work – back breaking work stooping and bending to pick hundreds of violets. 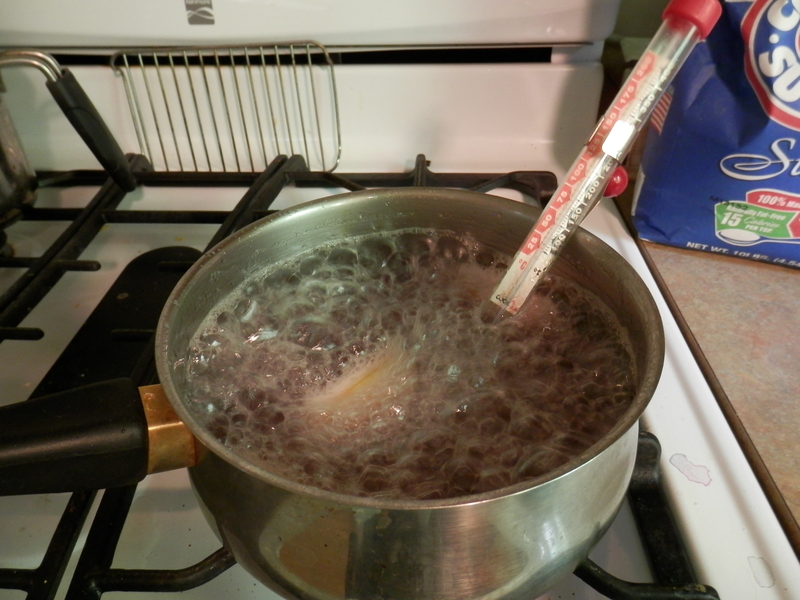 It was sweaty work sterilizing jars in boiling water and standing over a hot stove, stirring the mixture while it bubbled in the pan. But a magical thing happened – my stress just melted away as the day went on. Any time that I can spend outside in the garden and under the bright summer sun, any opportunity to be immersed in nature, is a healing balm to me. Add the alchemy of taking the gifts nature offers and transforming them, creating something of beauty – whether a lovely pastel jelly, an herb infused oil, a jar of pickles or a pot of garden vegetable soup – and I am in my zone. Chances are I may have to repeat the cooking and bottling if the jelly doesn’t set. I’ve done this before. Working with ingredients that have no natural pectin is always a gamble and I’ve learned that violet or rose petal syrup is still just as beautiful and tastes delicious over ice cream or pancakes, or as a sweetener in my tea. Love this post. Understand it completely!